Specialists at Capitol in gastroenterology and hepatology department treat people with diseases and disorders of the pancreas, liver, gallbladder, esophagus, stomach, small intestine and colon. 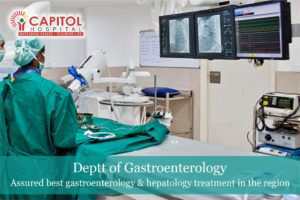 At Capitol, you will be assured of the best gastroenterology and hepatology treatment in the region when it comes various conditions of liver, gallbladder and other diseases of the upper digestive tract. Diagnostic and therapeutic endoscopy, including enteral stents, biliary stents, banding of esophageal varices, endoscopic treatment for gastrointestinal bleeding.